Opportunity Nation commissioned Measure of America to explore which factors, beyond wages, influence economic opportunity and long-term economic security for retail workers and the communities in which they live. 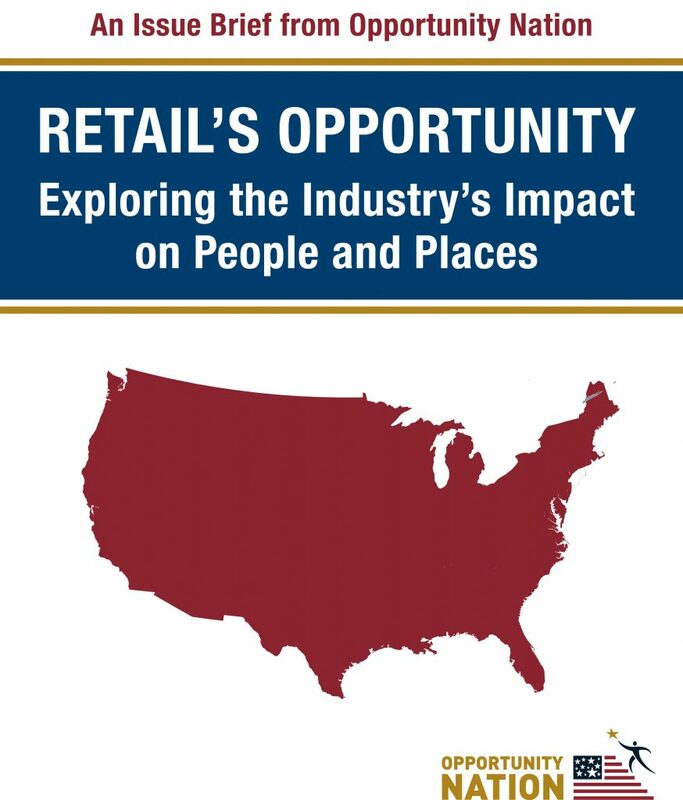 The resulting paper, “Retail and Opportunity”, was an input to an Opportunity Nation issue brief called “RETAIL’S OPPORTUNITY: Exploring the Industry’s Impact on People and Places”. Past research on workers in the retail sector showed that individuals face many obstacles on the path to economic success. This research investigated how retail employment relates to broader community conditions and individual-level characteristics with the aim to answer three questions. what is the relationship between state-wide opportunity and the rate of employment in retail across geographies? what is the relationship between state-wide opportunity and turnover in retail. which individual-level characteristics are most closely associated with retail management versus which are more closely associated with first-line retail workers? This Measure of America analysis found that higher rates of stable retail employment correlate with lower rates of poverty, lower rates of crime and higher rates of on-time high school graduation. In contrast, higher rates of turnover/replace and hire correlate with higher poverty, greater income inequality, and lower on-time high school graduation rates. When comparing individual retail supervisors to first-line retail workers, we saw significant gaps by gender and race; supervisors were more likely to be white and male, first-line workers to be female and black or Latino. The Opportunity Index was developed jointly by Measure of America and Opportunity Nation and measures 16 indicators, scoring all 50 states plus Washington, D.C. on a scale of 0-100 each year. In addition, more than 2,600 counties are graded A-F, giving policymakers and leaders a useful tool to identify areas for improvement and to gauge progress over time. Measure of America will help you choose the right indicators to tell the story of how people are doing in your community. For more information, go here.